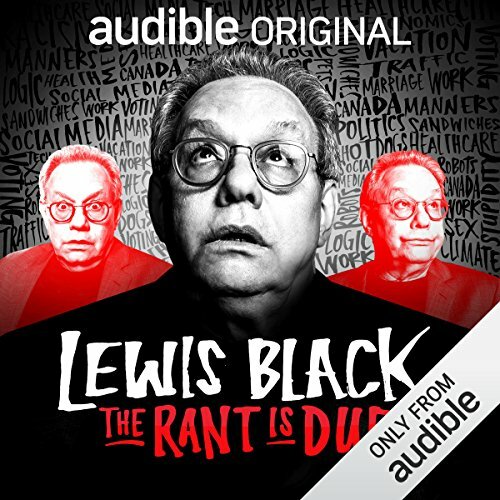 When you add The Rant is Due with Lewis Black to your library you will receive all 30 episodes, each with a runtime of approximately 5 minutes. ©2017 The Rant is Due (P)2017 Audible, Inc. This is hilarious. The only problem is it isn't long enough. I wish there was a season 3. Everything you love about Lewis Black is brought to bare in a 5 minute rant. Quick. Short. Hilarious. Then before you know it... its over and you're looking for the next one. The basic idea is that people have written in their rants to Lewis Black.. and he reads them (Lewis Black style) while he's performing in a random city. Sometimes the five minutes contains a couple rants. On occasion a couple friends help him out. Edie Ealco and Michael Potts comes to mind. I was already a fan of Louis Black so this was right up my alley. It doesn't disappoint. The topics range from mammograms to recent topics like the latest investigation into the president. I thoroughly enjoyed this project and look forward to more rants. This had me laughing out loud multiple times. I would recommend to anyone looking for a quick smile. A review requires at least fifteen words so hopefully this will be enough. Dang it! Listen to it, there are no flaws it needs to be longer is all. Listen to it, if you enjoy Lewis Black, or not you still might. Listen to it, if you want to laugh aloud, the man still breaths fire. Just listen to it already. The master of rant, Lewis Black, holds the mic out for the audience and most importantly, You, to share the woes of life from small and tedious to poignant and profound. Life gets a bit more bearable when we share our burdens and here’s your chance. It was good. Each chapter was too broken up. Wish they had been longer. he is hysterical! The irony is not lost on me. This would probably be better suited add a rant to Lewis Black about three way this is formatted on Audible. These are 5 min clips, each complete with intro and outro, that, unlike other books on here, did not auto play sequentially. So every 4-6 minutes, manually switch track, listen through production fluff, Lather, rinse, repeat. Some of the rants were weak, but Lewis is always great to listen to. Always a fan!